Mac Baren Scottish Mixture Pipe Tobacco, is a very mild and aromatic blend, produced from ready rubbed Virginias, golden brown Burleys and toasted Cavendish tobaccos. 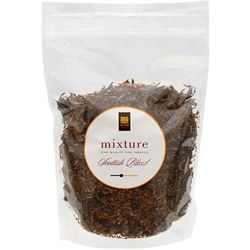 Introduced in 1958, this Scottish Blend pipe tobacco mixture consists of more than 35 assorted tobacco leaves from various locations around the world. Remarkably smooth, stays lit easily, producing sweet and pleasant aromatic room notes.